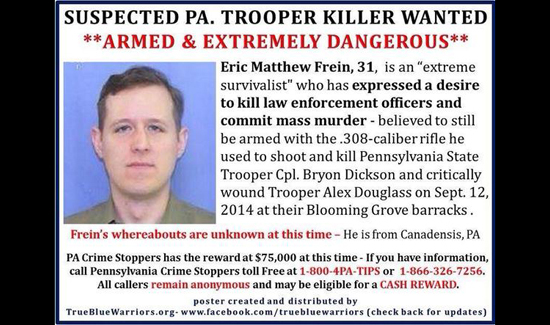 According to a report from ABC News, Pennsylvania State Police say they have found writings left by suspected cop-killer Eric Frein that provide clear and chilling insight into the mind of a murderer. Lt. Col. George Bivens read from the journal he says was written by Frein to the media. Bivens said the suspect wrote that he took two shots and watched as the murdered officer fell “still and quiet,” before shooting a second trooper. Investigators believe that excerpt refers to the late-night ambush that killed Cpl. Bryon Dickson and seriously wounded Trooper Alex Douglass. “I will tell you, after reading this cold-blooded and absolutely chilling account, that I can only describe Eric Frein’s action as pure evil,” he said. ABC News affiliate WPVI Action News also obtained a copy of one of the search warrants executed on the suspect’s home. Predictably, authorities found dozens of handguns, high-powered rifles, ammunition, bomb making material and even gear to make homemade bullets. 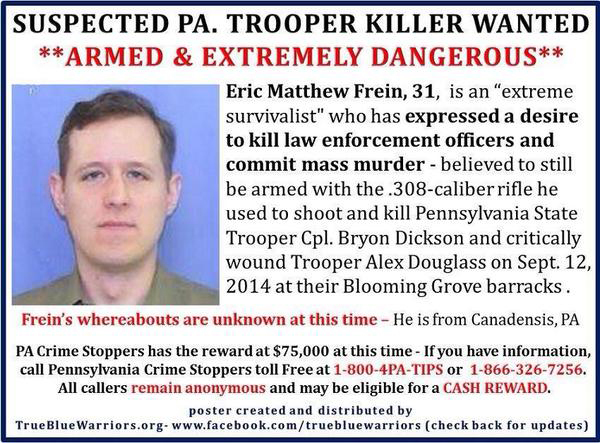 “The Pennsylvania State Police didn’t pick this fight but it is ours to finish,” Lt. Col. Bivens told reporters. The difficulty is that once these guys get into the woods they become increasingly hard to apprehend- especially if they have military training and an intimate knowledge of the terrain where they’re holed up.